'Diabolical Liberties' Album Out Now! Available now in limited number from Topplers - 'Diabolical Liberties', the debut LP from Jowe's latest musical vehicle. Containing 13 tracks of wonderfully twisted pop, the CD is limited to just 100 copies. The first 50 copies of the album will include a piece of Jowe's artwork, signed personally by the man himself. Topplers have 20 such copies of these special versions, to be sold through their website (the remainder will be sold at Demi-Monde gigs). Get one quick! Available now from Topplers for £9.99 (includes UK postage). 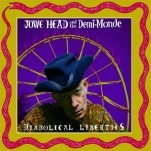 "Jowe Head is backed by a new band called The Demi-Monde on recordings for an ambitious new album called 'Diabloical Liberties', to be released by Schnitzel Records on CD at the end of the year. The album tracks will be selected from a total of seventeen tracks recorded. There is also a single planned for release on vinyl. The sound has a psychedelic feel with a blend of electronic and acoustic sounds, as well as a pan-european folk influence and Indian and Moorish elements. Contributing musicians include Lee McFadden (Alternative TV and Angel Racing Food), Jane Ruby (Naked Ruby), Kate Newell and Miss Roberts (Rude Mechanicals), singer Catherine Gerbrands, guitarist Heath Stanley (Olives Hairy Custard), violinist Phil Martin (Long Decline, Bitter Springs), and members of Chrome Hoof. There will be some concerts involving a variety of people involved in this project. The Demi-Monde will be a flexible on-stage project involving anything from three to seven members at different events." During his trip to the USA in April, Jowe recorded a session for WFMU in New Jersey. This will be broadcast on the 'Cherry Blossom Clinic' show on Saturday 12th July, from 3pm - 6pm (EDT) (8pm - 11pm in the UK, + 1 Hr for CET). There's a live stream via the internet - see link below. Thursday April 10th: recording of radio session at WFMU in New Jersey. Transmission expected on Saturday April 12th. Friday April 18th: Concert at Claude's Bar, Phoenicia NY starting at 8pm. Also playing JRBW. Jowe's next exhibition, showing different pictures, is in the solo room at the Arts Upstairs Gallery in Phoenicia NY, and it opens Saturday April 19th at 6pm for 4 weeks. ARF Debut Album Out Now! Available now from Topplers, the eponymously-titled 'Angel Racing Food' contains 11 terrific tracks from Jowe and his band. The CD is available now from Topplers for just £4.99 (plus postage) for a limited time only if you use this link. 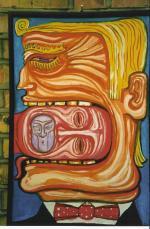 An exhibition of Jowe Head's art, entitled 'All You Can Eat', will run from 6th - 22nd April at Praxis Hagen in Berlin. The gallery can be found at 76 Sonnenburger Strass, Prenzlauer Berg 10347 (U-bahn and S-bahn: Schönhauser Allee). This is Jowe's first exhibition outside the UK. You can now find pages for Jowe Head and Angel Racing Food on Myspace. New Jowe Head Album Out Now! 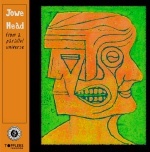 Available now from Topplers, 'From A Parallel Universe' is a new limited edition 10 track solo album from Jowe Head. Among the tracks are covers of Bacharach / David, Sun Ra and Kevin Coyne originals. There's also a reworking of 'Cake Shop Girl' from Jowe's Swell Maps days. The CD is available now from Topplers for just £4.99 (plus postage). Copies can be ordered via the website. I recently recorded a version of EVIL ISLAND HOME by Kevin Coyne track for a tribute album marking the anniversary of his unfortunate death, with the proceeds going to a mental health charity. You know of him? He best known for his work on the Virgin label in the mid-1970's. Get to hear MARJORY RAZORBLADE or CASE HISTORY if you can! Anyway, they invited me to play at the place, so I hope to do that next year with some other activity in the USA. 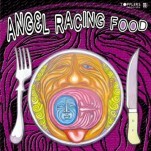 Lee McFadden and myself are putting together a new line-up of ANGEL RACING FOOD. We may not keep the name, though... I am trying to think of a new name that keeps the ARF initials! We recently got together with Marina from LONG DECLINE, and the mighty Jeff Bloom from the TV PERSONALITIES and HOUSEHUNTERS. Sounds terrific! I mention this, cos we're trying a version of "Submission" also by the Pistols. Masque, an electronic / noise duo from Glasgow have recorded a cover of Jowe Head's 'Merman Blues'. The file is available for download from Topplers Records at the link below (3.6 MB). Still available from Topplers is the original Jowe Head 'Merman Blues' 7", for just £3. Jowe reports that he has finished the cover art for the forthcoming Swell Maps project "Waistrels And Wippersnappers", culled from his personal tape archive. The recent line-up of ARF has now disbanded, but I'd like to play with them all again in some form or another if possible. We had great times together. It's a real shame! We had some great new songs together, written by me and some by Nick. I'd like to record some of these somehow. Me and Lee shall probably play together again soon - I don't know any more than that at the moment. Anyway, we have 11 great recordings in the can, which I will compile into an album, so thats a cause for celebration, eh? No label yet though. I'll keep you posted. Olive's Hairy Custard CD out now! The Olive's Hairy Custard CD is now available from Topplers. See links below and get it while it's hot! Printing delays have held up the release of Topplers' Olive's Hairy Custard compilation. For more details, including track listing and ordering information, visit their website. The latest issue of trakMARX fanzine includes an interview with Jowe Head. Unreleased TVPs & Jowe Head on new LP! Just released, 'Falling Uphill' is a superb compilation album from the USA. Among the tracks are a previously unreleased TVP song and three other tracks featuring Jowe Head. One of the many highlights on the collection is 'Virgin and a Whore', a previously unreleased TVP gem recorded for a radio session during the band's tour of the USA in spring 1992. Jowe Head contributes the previously unreleased 'Serpentine' (originally recorded for the long lost 'Bobit Juice' project), and his latest group Angel Racing Food feature with the wonderful 'Guinea Pig'. There's also the previously unreleased 'Whipper Snappers' from his previous group, Olive's Hairy Custard. Jowe additionally contributed the cover art. The CD also contains exclusive tracks by Barbara Manning, Sixtynine and the Continuous People and the Container Drivers, plus great indie pop by the likes of the Woog Riots, Katze, the Bartlebees and many more. You can buy the CD through this website here. Alternatively, visit the Windless Air Music website. This is one CD you really should own! 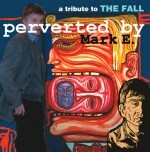 Just a quick note to tell people that 'Perverted by Mark E', the Fall tribute album for which Jowe donated his cover of 'Choc-Stock', can be purchased in the UK via the Container Drivers (at a great price, too). The CD does not have a UK distribution deal yet. New Jowe Head Single Out Now! The Jowe Head single is now available from Topplers Records. Copies can be ordered via the website. The Long Decline will have their long-delayed 'Decomposure' album released through Step Forward Records on June 28th. Jowe Head contributes bass and backing vocals to the recordings, and Angel Racing Food's Lee McFadden also features. Released on 3rd May on the German ZickZack label, 'A Tribute To The Fall - Perverted By Mark E.' includes Jowe Head's bouncy cover of The Fall's 'Choc-Stock'. Recorded back in 1994, the track gets a welcome release. Jowe has also contributed to the CD's artwork. The album additionally contains a track by The Container Drivers, featuring the talents of this webmaster. Compiled by The Woog Riots, the CD will only be distributed initially in Germany, Switzerland and Austria. A mail order facility will be in place at the beginning of May on the Woog Riots website below. New Jowe Head Single Out Soon! Topplers Records, home of The NoMen, are to release a single comprising two tracks originally intended for Jowe's unreleased 'Bobit Juice' album. 'Merman Blues' b/w 'Baby Bounce' should be out in May 2004. Visit the Topplers site for more details. A selection of Jowe's artwork will be exhibited at Intoxica Records, 231 Portobello Road, London W1, from 19th December 2003 until 4th March 2004. The NoMen have added five more covers of Jowe Head songs to their site, available for download. Two tracks are from the 'Unhinged' album, with the remaining three songs coming from Jowe's unreleased 'Sly-Boots' project. The long-awaited 'Venus Bigfoot EP' has now been released by Little Teddy (catalogue LiTe750). Please make cheques / PO's payable to "S. Bird". The EP can also be obtained from Rough Trade mail order. Jowe has donated a cover of The Fall's 'Choc-Stock' to a tribute CD which is being put together by the German group The Woog Riots. The project, which is a mixture of covers and originals, is due for release later in the year. Vinyl Japan have issued a compilation CD of BMX Bandits radio sessions, 'On The Radio (1986-1996)' (catalogue ASKCD 105). This includes the track 'Figure Four', recorded for Janice Long in 1987, on which Jowe Head played trombone. Scottish band the NoMen have recorded versions of two tracks that were released on Jowe's first solo LP, 'Pincer Movement' (1981). 'Cake Shop Girl' and 'Mermaid' are available for download on the MP3 section at Topplers Records website. ARF have expanded to a four piece with the recruitment of Nick Smith on bass. Current lineup is Jowe Head (guitar and vocals), Lee McFadden (lead guitar and vocals), Nick Smith (bass) and Michael Frangou (drums). Meanwhile, ARF's debut single, the "Venus Big-Foot" EP is to be released in the New Year by Little Teddy. The Long Decline, featuring Jowe Head on bass, as well as ARF's Lee Mcfadden, have a new LP awaiting release. "Decomposure" will be issued in Europe by Little Teddy, catalogue BiTe037, towards the end of the year. A US release is also planned.